The Work Style in SmartPhone. Let the easy and freedom work! When you work with Wamoeba, you decide when and how long and where to work. When you’re ready to work, you just need the Mobile Phone (tethering function) and your time. and that can change to cash income. Mobile Phone is in here. Internet Environment (data traffic) of the SmartPhone is what you are holding paying money. Every month, Data Traffic could not fully use. And that was carried over to the next month. You bought because It was not enough, but It was surplus. There will be surely that you were also experience. Such your Data Traffic will change to Cash Income from today. Data traffic of mobile phones, the Internet environment will slow using too many. However, didn't use almost it. And surplus. It will eventually carry over to the next month. And also surplus. I want more effective use of such data. Let try make money in wamoeba. I bought Data with Additional. I used up the data communication fee at the end of the month, and the Internet environment became worse. I felt that's a bit pricey. But, I bought an additional data communication fee because I need. Using only the necessary amount, I thought rest of data had wanted to somehow. Let try make money in wamoeba. with good use of time. The data communication fee of mobile phone regardless, we wanted to better take advantage of the free time, lunch and hobbies times. I thought that's good, if can start to work immediately on the spot. Let work with wamoeba. Right now. “Mobile Phone” Working on Your Behalf. 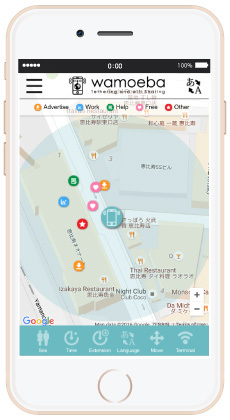 Wamoeba is smart mechanism that can lend the Internet environment (data communication) by the hour for the people who are in trouble in the Internet environment using the tethering (sharing function of the wifi). As a main business, as a sideline, as effective utilization method of free times. Let get started? After Sign up, you can begin to immediately work in one mobile phone only. You will only share. Worker is Mobile Phone. The Style is “Make Mobile Phone Work”. Don't need possessions, skills, communication, is a proposal of a new work style. The data communication of mobile phone is changed in income by the hour. Your body is freedom OK, if there are a mobile phone and the data remaining amount. Limbs, thinking, visual, olfaction, hearing, are everything freedom. Everyone can start right now. Let make the mobile phone work. 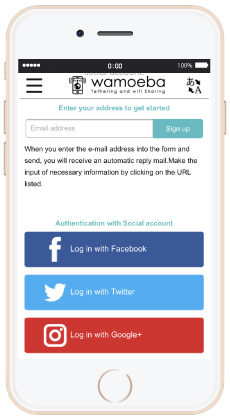 Sign up by entering the e-mail address. Please other necessary information also input. When you finished Sign up service can start. Start and rest and resumption of service can use of 1-tap from the management screen. Your mobile phone will be posted anonymously as a wifi spot. Who Want to Use Internet Environment Right Now. 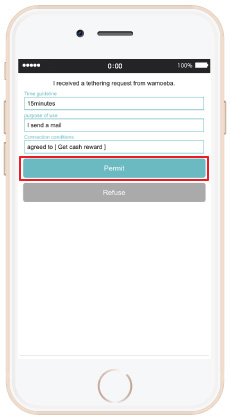 Your registered mobile phone will receive of share request from a customer. You will receive the notice (purpose of use, and using time) also at the same time. You will check the use time and use purposes. If there is no problem, to send the permission of the connection. Send Enter your wifi name and password. Jointers and connectors can take contact with the chat function in the wamoeba. Or there is a problem with the connection distance, you do not see the wifi name, for example, if the password is incorrect please hand in contact in a chat board. Please Wait During a SmartPhone is Working. Let the wait in 30minutes when the connection is started. 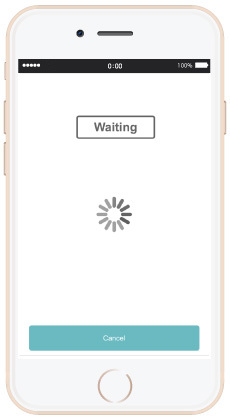 You have to wait in the connection range when the connection is started. Mobile phone connection time will be your income. 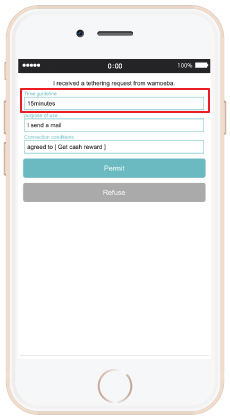 If the customer to end the use within 30 minutes you will receive a use end notification. If the customer want to extension, you will receive the extension notice of 30 minutes. Please tap of choose whether OK. Please wait again for 30 minutes if you can acceptance. After connecting end you will receive a connection end notice. You must change wifi password always after connecting end. It is possible to immediately change from setting screen of the mobile phone. 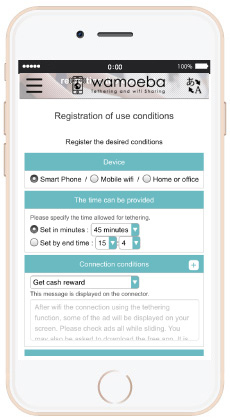 (Prevention of automatic re-connection) And, please evaluate the user. Don't worry to unpaid money because It's pre-payment. Even if wifi is started published you can safely use because it is anonymous. You don't need to directly communication before and after each share. There is also no limit during publish of wifi. Slowdown or during the move are also no problem. Work will happen in freedom living. You and the customer must submit the authenticated information, including phone number. Will be given the chance to write an evaluation and reviews to everyone when the connection end. Because it is reflected in everyone, will lead to everyone's motivate. The New Style is “Make Mobile Phone Work”. Let Try to Work!